Ceo Zip zipper portfoliio with handles. The exterior of this zippered padfolio features retractable handles and a front slot pocket. 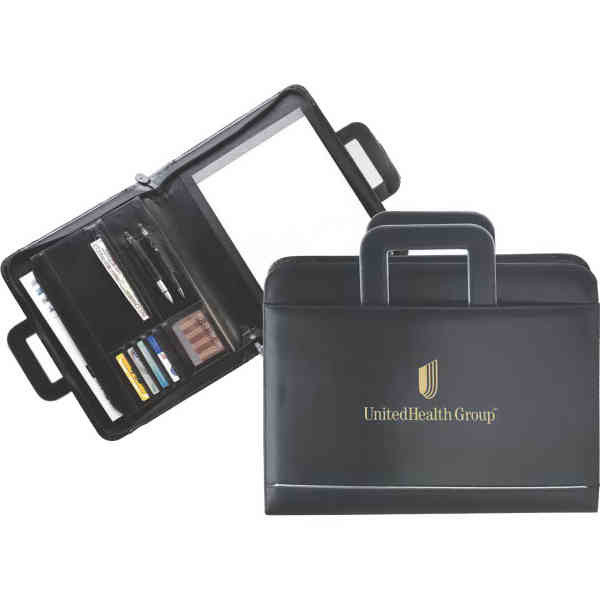 The interior includes an open gusseted file slot, an interior organizer with business card slots, an 8 1/2" x 11" memo pad and pen loop. Made of simulated leather. Size: 11 1/2 " x 14 "
Ship Weight:29 lbs, Orders are normally shipped via Ground service, unless otherwise noted. Price Includes: Setup charge plus cost of item on domestic items. Allow 3-5 working days for production on domestic. Price Includes: Random available on some items by request only. Random imprinted items cannot be returned.